Disney presents a high-tech motion picture unlike anything you've ever seen ... Immerse yourself in the digital world of TRON, as celebrated actor Jeff Bridges stars in a revolutionary visual effects adventure beyond imagination. When Flynn, the world's greatest video game creator, sends out a secret signal from an amazing digital realm, his son discovers the clue and embarks on a personal journey to save his long-lost father. With the help of the fearless female warrior Quorra, father and son venture through an incredible cyber universe and wage the ultimate battle of good versus evil. Bring home an unrivaled entertainment experience with TRON: Legacy in jaw-dropping Disney Blu-ray - complete with never-before-seen bonus features that take you even deeper into the phenomenal world of TRON. $44.026 million on 3451 screens. For years and years, rumors of a sequel to 1982’s Tron persisted. For the life of me, I could never figure out why Disney would pursue a second chapter in that saga. While visually groundbreaking, the origin Tron was a snoozer than failed to make a dent at the box office. Outside of a small niche audience, no one clamored for more. So why pursue it 28 years later with 2010’s Tron: Legacy? I have no idea, but at least this time, the studio can claim it produced a hit. Legacy raked in a pretty solid $170 million in the US. Granted, that merely equaled the film’s budget, but it still represented a good financial showing. It remains to be seen if a third Tron flick will emerge. After the first two, I can’t say I’m too anxious for more. Legacy briefly recaps aspects of the first film and tells us that visionary game designer Kevin Flynn (Jeff Bridges) mysteriously disappeared in 1989. He left behind a young son named Sam, and we re-encounter him as an adult in the modern day (Garrett Hedlund). Given his daddy issues, he’s something of a rebel/loose cannon. He has a financial stake in ENCOM, the software company his father led, but he doesn’t get involved in it beyond some attempts to sabotage their capitalist efforts. Sam assumes his dad departed for selfish reasons, but he learns of a different possibility when he hears from Kevin’s old pal and partner Alan Bradley (Bruce Boxleitner). It turns out that Kevin’s fantastic stories of adventures in “the grid” were true, and Kevin may be stuck in that computer location. Sam determines to rescue his long-lost dad, so we follow his adventures along the way. 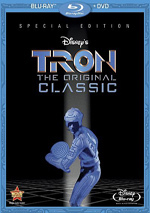 When I saw Legacy theatrically, I’d not viewed the original Tron in almost nine years. I didn’t remember the earlier flick tremendously well, so I thought Legacy might’ve lost some points due to a lack of familiarity with its predecessor; maybe it’d work better if I boasted a closer acquaintance with the 1982 movie. Or maybe not. My second viewing of Legacy immediately followed my screening of Tron on Blu-ray, so that double feature meant I’d be prepped and ready to take in the saga as a whole. And it didn’t help. Legacy doesn’t really provide a smooth continuation of the first film. 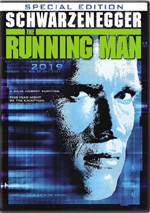 It uses some of the same characters and themes, but it essentially stands on its own; a few of the references and characters – such as Dillinger’s son – make more sense when connected to Tron, but those aren’t important. That doesn’t mean it’s not fun to see how the sequel updates the original's concepts and elements, though. While you don’t lose much if you go into Legacy blind, you’ll probably get a little more out of it if you know the first movie. It comes with more than a few links to its predecessor, so some of the fun stems from the recognition of these. Which is good, because Legacy lacks a great deal of fun in other ways. That doesn’t make it a bad movie, and I actually like it more than the original. That falls into the “faint praise” category, I admit; Tron boasted groundbreaking effects but it came with a thin story and forgettable characters. That remains true for the sequel, but it boasts a better sense of energy. While the original’s action scenes looked awesome in 1982, they weren’t actually all that exciting; the movie concentrated so much on pushing the technological envelope that it forgot to make something with any punch. No one will regard the effects of Legacy as anything remarkable; with a notable exception I’ll mention, they’re very good, but they don’t do anything amazing within the context of 2010’s technology. That’s fine with me; the movie doesn’t need to stretch any boundaries, and at least it better integrates its effects into the action. Legacy takes the stiff disc battles and lightcycle races of the original and makes them vivid and compelling. Those become easily the movie’s best scenes. Unfortunately, they occur pretty early, so it’s downhill from there. The story essentially turns into something that feels like an off-shoot of the Matrix series, and it doesn’t make a ton of sense. Even when it does go somewhere, it lacks much to make it involving, a factor affected by the dull nature of the Sam character. He’s simply a forgettable personality; he’s a pretty face but not someone about whom we ever invest our emotions or interest. It’s nice to see Bridges back for more fun, though his presence inadvertently leads to one of the movie’s flaws: his computer-generated visage as Clu. The movie uses effects to present a younger-looking Bridges, and it just doesn’t work, at least not for what we’ll accept in 2010. If we’d gotten a character who looks like Clu five years earlier, we’d probably buy him entirely, but for 2010, the CG face looks awfully stiff and dead-eyed. I don’t want to come down hard on Legacy, as I think it’s a reasonably entertaining movie, and it’s certainly a substantial improvement on the dull original. However, being better than a snoozer doesn’t make it good. Legacy includes just enough action to keep us with it, but its generic characters and forgettable story mean that it can’t become better than average. 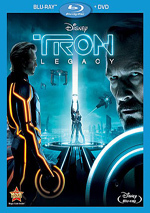 Tron: Legacy appears in an aspect ratio of approximately 1.78:1 and 2.35:1 on this Blu-Ray Disc. No, it doesn’t provide two separate renditions of the film. Instead, ala the Dark Knight Blu-ray, the framing occasionally opens up from the standard 2.35:1 to go to 1.78:1 and come closer to the IMAX dimensions for certain scenes. Did this create a distraction? Not to me. The varying aspect ratios of Dark Knight could be a bit jarring because they’d happen so much; we’d go to 1.78:1 for only a few seconds and leap back and forth too frequently. That’s not an issue here; Legacy went 1.78:1 mainly for extended action sequences, so it didn’t present the jumpy feel of Dark Knight. I thought it was a smooth presentation. Whatever aspect ratio we saw, the image looked great. Sharpness was consistently tight and distinctive. Virtually no softness ever appeared during this crisp, well-defined picture. I witnessed no signs of shimmering or moiré effects, and the image suffered from no edge haloes, artifacts or other distractions. Source flaws failed to appear at any time. Legacy opted for a stylized, often virtually monochromatic palette. We got a mix of colors – primarily blues, reds and oranges – but they didn’t interact a whole lot; instead, whole sequences would go with one or another. That made sense for the film’s dynamic, and the colors always seemed full and rich. Blacks were deep and dark, and shadows appeared full and well-developed. If the whole movie had stayed 2.35:1, it still would’ve been terrific, but those 1.78:1 elements were even better. They took the transfer to another level and made this a consistently excellent image. Don’t expect the presentation to sag with the movie’s DTS-HD MA 7.1 soundtrack. The soundfield used all five channels to a terrific degree, as the film presented almost no periods in which the entire spectrum wasn’t activated. The forward dimensions seemed accurately spaced and well-delineated, with audio that moved cleanly from speaker to speaker and that appeared realistically placed. The surrounds kicked in with a tremendous amount of information that created a convincing and immersive auditory environment. Audio quality also seemed terrific. Dialogue sounded warm and distinct, with no signs of edginess or problems related to intelligibility. Effects were appropriately loud but they appeared accurate and clean, without any distortion. Music was similarly dynamic and bold, as the score and the various songs appeared fairly well-presented. Legacy is the kind of film for which you spend big bucks on an awesome home theater, and the track earned its pay. Despite the movie’s fairly high profile and reasonable box office success, the Blu-ray lacks a strong roster of extras. The Next Day: Flynn Lives Revealed offers additional backstory for Legacy, as it provides info from the period between Flynn’s 1989 disappearance and the movie’s events; it also throws in a coda. The latter provides exclusive footage of some Legacy actors as well as Dan Shor, RAM from the original. When the main program ends, an image of an arcade game “high score” screen appears. See those initials listed? Enter any of them and you’ll find more “Flynn Lives” footage. Or just submit “ALL” and you’ll get the whole package of them. These are clever and fun attempts to expand the movie’s story. A few featurettes look at the production. Launching the Legacy runs 10 minutes, 20 seconds and provides comments from Tron writer/director Steven Lisberger, producers Jeffrey Silver and Sean Bailey, director Joseph Kosinski, writers Edward Kitsis and Adam Horowitz, co-producer Justin Springer, and actor Jeff Bridges. “Launching” looks at the development of the sequel, getting different elements off the ground and a test trailer, script/story issues, and technical topics. “Launching” provides a basic take on the franchise’s reignition. A few decent details emerge – and it’s good to see that concept trailer – but there’s not a lot of meat here. During the 11-minute, 46-second Visualizing Tron, we hear from Bridges, Kosinski, Bailey, Lisberger, Springer, production designer Darren Gilford, additional costume designer Christine Bieselin Clark, VFX art director Ben Procter, lead concept artist Neville Page, Quantum Creation FX’s Christian Beckman, Quantum FX costume department head Justin Raleigh, VFX supervisor Eric Barba, head of animation Steve Preec, motion capture production manager Robert Keychobad, and actors Olivia Wilde, Garrett Hedlund, and Beau Garrett. We get information about set, costume and prop design here along with thoughts about effects and shooting 3D. Some of this tends to tout the wonderful nature of the work, but we still get a lot of nice notes, and the instances of concert art help. Installing the Cast goes for 12 minutes, four seconds and features Bridges, Wilde, Hedlund, Kosinski, Lisberger, Bailey, and actors Michael Sheen and Bruce Boxleitner. This one discusses actors, characters and performances. Though we hear a few interesting notes about challenges of working in such an effects-heavy world, mostly this one exists to praise the cast. Finally, Disc Roars goes for three minutes and takes us to Comic-Con. We get remarks from Kosinski and Bridges and watch as the audience at Comic-Con tapes crowd chants for use in the film. It’s mildly interesting. A Music Video for Daft Punk’s “Derezzed” lasts two minutes, 58 seconds. This offers unique Tron-styled visuals – and a cameo from a movie actor - paired with the electronic song. The tune’s not memorable, but the video itself is fun. Promotional material provides a First Look at Tron: Uprising. This one-minute, 15-second clip acts as a trailer for the upcoming animated series. Don’t expect any information or insight; it really is just a promo. The disc launches with ads for Pirates of the Caribbean: On Stranger Tides, Tron: Uprising and Prom. These also show up under Sneak Peeks with clips for the Tron: Evolution video game, Cars 2, African Cats and The Incredibles. No trailer for Legacy appears here. 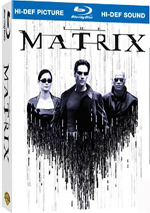 A second disc offers a DVD copy of Legacy. This offers a nice bonus if you haven’t gone Blu yet or if you just want a spare to watch on the road. Although I like Tron: Legacy quite a bit more than the original, that doesn’t make it a good movie. It has enough positives to keep us with it but it suffers from too many weaknesses to jump to a higher level. The Blu-ray presents excellent picture and audio but skimps on supplements. This becomes a stellar technical presentation for an occasionally entertaining film.